The victor, Pompey, turns his attention to Valencia. It is 75 BC and Sertorius is defeated and dead. 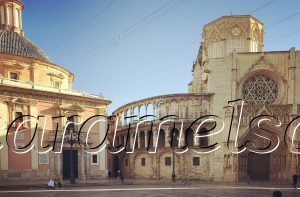 Valencia is home to 2000 Roman soldiers who had supported Sertorius. In Pompey’s eyes, they are traitors. And so without hesitation, he burns Valencia to the ground. It was only 70 years before Pompey’s destruction, that Decemis Junus Brutus, a Roman soldier, built a small city on an island called Valentia Edetanorum. 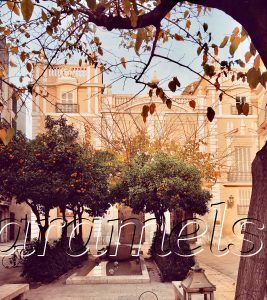 It is bound by two rivers, one of which is the Turia, a splendid walk within Valencia. 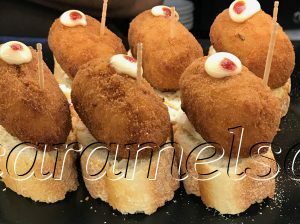 (See my River Turia blog). The heart of this Roman city is the  Plaza de la Virgen. 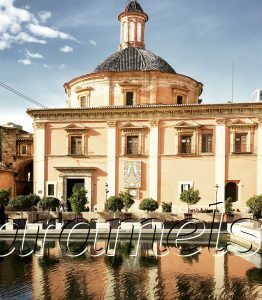 The eye catching blue dome is the  Basilica de la Virgen, whose origins lie with a priest who intervenes to protect a vulnerable man on the streets. Whilst sat inside admiring Palomino’s painted dome, I read the fascinating account of how a hospice for the mentally ill transforms to this church which houses the revered “Virgen de los Desamparados“. Two Roman roads, the  Calle del Salvador and the  Calle de Caballeros, cross each other at the Plaza de la Virgen. Through the shallow pond behind the Basilica, I look down into the archaeological dig below. Six feet underneath me is a part of the original Calle del Salvador, just as it was in Brutus’ time. It’s quite remarkable wandering around the  L’Almoina Archaelogical Museum. 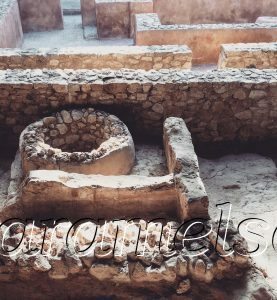 In this huge dig site, I find the remains of Roman baths, the Visigoth city and the Arabic Alcazar, all clearly marked up in the museum guide. It’s just a shame that the introductory video is not in English. Back overground, flags outside several of the buildings around L’Almoina indicate their official nature. 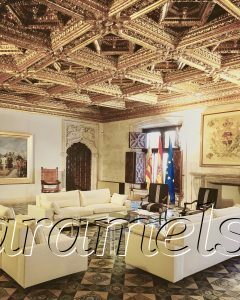 One previous government building is the 19th century  Palau del Marques de Campo. 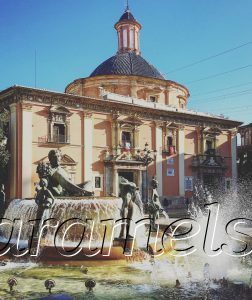 It becomes the Ministry of Health during Valencia’s tenure (1936-1937) as the capital of the 2nd Republic of Spain. The anti monarchy and anti Catholic church rhetoric of the 2nd Republic of Spain (1931-1939) does not last long. For Spain falls under the control of the dictator Franco until 1975. There is little evidence of that turbulent time in Spain’s history in this building as, I wander around the marvellous art museum it is today. 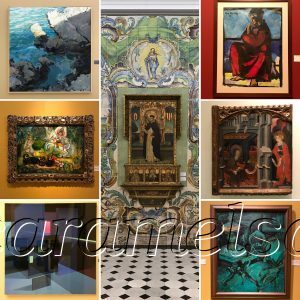 There is lots of wonderful art to peruse in the Palau del Marques de Campo. 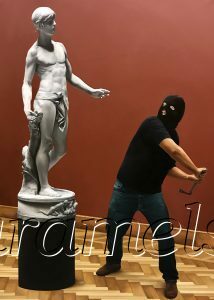 Across its three floors, I enjoy Renaissance art, 20th century art and even some modern art. And the chance to wander around its beautiful rooms and magnificent stairwell. Just next door to the Palau is the  Cripta de Archaelogica de Sant Vicent Martir. The very informative audiovisual, available in English, guides me around this old Visigoth church and crypt, which is later converted to Arab baths. 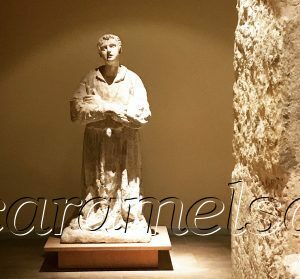 Today it’s a crypt dedicated to the memory of St. Vincent. St Vincent of Saraggossa was a dedicated follower of Jesus, whom the Romans had crucified some 300 years ago. The Romans, keen to stop Christianity from spreading, tended to engage in a bit of rough treatment. And so poor St. Vincent is held prisoner in this location, and tortured most horribly and eventually martyred, as described here. The audiovisual narrates his torture which he stubbornly survives. It includes stretching him on the rack and burning his body with sulphur. When he finally succumbs, the Romans hurl his body into the sea. But with some well timed divine intervention, his body washes up to shore, and his followers told where to retrieve his body being protected by ravens. 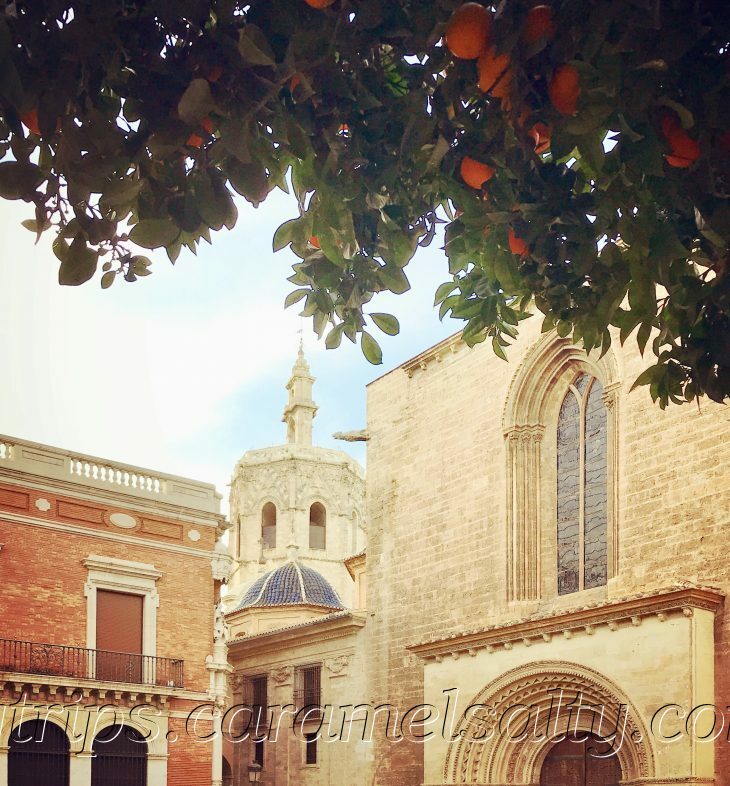 St. Vincent’s martyrdom actually helps Christianity spread in Valencia. He is buried at La Roqueta, along via Augusta, an important medieval road I mention in my Xátiva blog. But one part remains in Valencia. 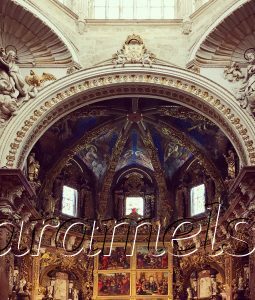 His wizened arm, behind the main altar in Valencia’s cathedral. 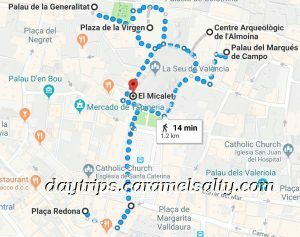 My route thus far has circumnavigated Valencia’s imposing  cathedral (La Seu). An archway above the street connects the Basilica de la Virgen and cathedral. Another one connects the cathedral to the Archbishop’s Palace. Which must save His Grace from being rained upon. Having been built between the 13th and 15th century, the cathedral’s entrances is a one stop shop of medieval architectural style. The main tourist entrance is baroque (cherubs and bows). The one facing Plaza de la Virgen is Gothic (heavy architecture, statues of saints, rose window). And finally, the third by L’Almoina is Romanesque (perfect semicircle arches) . 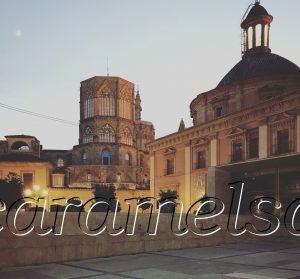 Like the archaeological site, the cathedral’s location is the religious focus of those who rule Valencia. It’s built on the site of a Roman church. After the fall of the Roman Empire around 450 AD, the invading Germanic Christian Visigoths build a church. The Moors replace it with an open plan mosque. 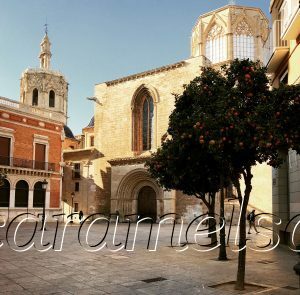 And, finally, when the Catholic James I conquers Valencia in 1238, the mosque is demolished to make way for this cathedral. The cathedral is a pilgrimage destination. Apart from St Vincent’s body part, there is the Madonna whom pregnant women pray to in their 9th month of gestation. 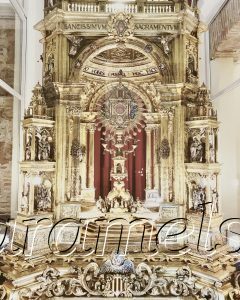 And for art lovers, there are two Goyas in the Capilla de San Francisco de Borja. 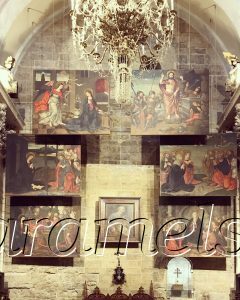 And paintings by Palomino in the Capilla de San Pedro. Many years ago, I remember watching Indiana Jones hunting for the Holy Grail (Santo Giral) somewhere around Turkey. He should have just flown to Valencia instead. Because that Christian relic from the Last Supper is claimed to be here in this cathedral. It’s in the very medieval looking chapel of Santo Caliz, next to the cathedral’s museum. 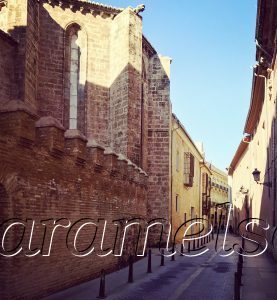 Just off Plaza de la Virgen, on Calle de los Cavalleros is the  Generalitat (1418). 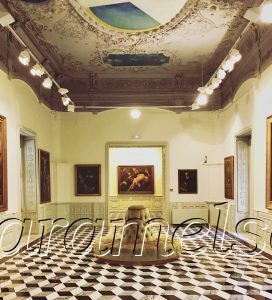 As it’s their 600 year anniversary, I’m allowed to freely wander around the sumptuous government rooms of Valencia’s tax raising body. However, I understand that today, the Valencian government is also having to sell off assets to pay off their debts. Rather appropriately I finish off by wandering down  Carrer de Sant Vincent Matir. Through a little alley I find the small, circular  Plaza Redonda and it’s charming craft shops. And tucked away in there is an inviting little tapas restaurant,  Pinxto‌ i Trago. A lovely end to my day of Romans, martyrs and the Holy Grail. 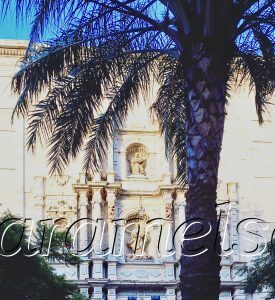 Basilica Virgen de Los Desemparados (tourist website)- Open daily, a.m. and late evenings. Free Entrance. L’Almoina Archaelogical Musuem (tourist website)- Closed Mondays. Sunday’s a.m. only. Small fee. Free on Sunday and with the Tourist Card. 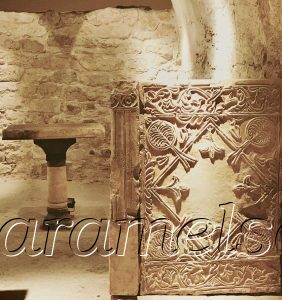 Cripta Arqueológico de San Vincent Martin (tourist website) – Open daily, a.m. to late. Small Fee. Free on Sunday and with the Tourist card. Generalitat (tourist website) – Open Mon-Fri. Till mid afternoon. Free. Placa‌ Redonda (tourist website) – Open daily.